If you got bad news, you want to kick them blues … auction. You may never be able to play the guitar like Eric Clapton, but at least now there's a way to get close. And by "close," we mean you can own some of the legend's gear (talent not included). The rock Hall of Famer and arguably one of the greatest musicians of all time is putting more than 70 guitars and 70 amps on the auction block. The auction is scheduled for March 9 in New York, but with online bidding, Clapton lovers can bid from anywhere. The catalog has been posted on the web, but for Angelenos, there's a chance to see the goods in person. Auction house Bonhams & Butterfields is hosting LA viewings that run Feb. 18-20 at 7601 W. Sunset Blvd. from noon to 5 p.m. Small-time bidders may be able to scoop some items for a couple hundred bucks. Serious fans, though, will have plenty of opportunities to write big checks. 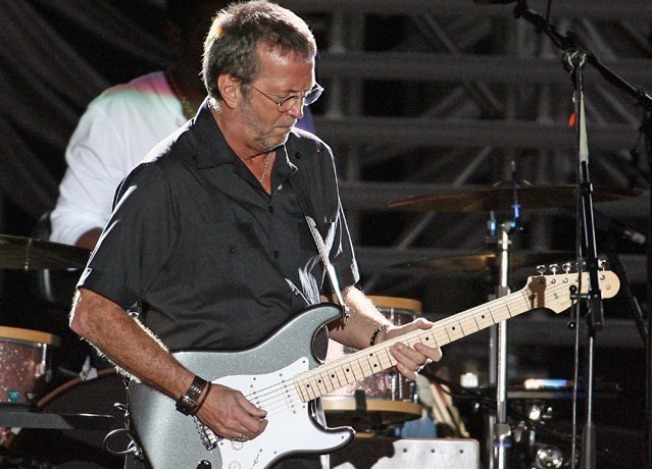 Clapton's 2006 Fender Stratocaster "Blackie Replica" is expected to go for $20,000-$30,000. A 2004 Martin 000-ECHF Bellezza Bianca is estimated to sell for $15,000-$20,000. The auction is being held to benefit Clapton's rehab center, according to the auction house. "I am very happy that Bonhams have agreed to host my third guitar auction in aid of The Crossroads Centre, Antigua, the drug and alcohol rehabilitation centre I founded in 1998," said Clapton.